Let’s get this out there right to start with: Stealing is bad, mkay?! Now, that we have made this clear, here is a very relevant, alternative fact: A) Stealing. B) … C) Profit! And while A and C are very real elements of Age of Thieves, it is Segment B which this game is mostly about. Age of Thieves is not about collecting victory points or anything mundane like that. It is about nothing less but fleeing a city under a full-fledged state of alarm – with guards roaming the streets and alleys – while casually carrying the most valuable jewels you can out of the city. 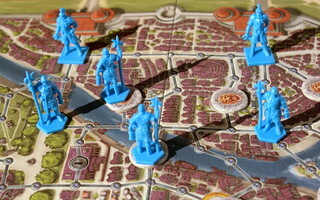 At the start of the game, however, the game board representing the city is a much calmer place. You have the typical amount of guards lurking around, but no immediate sense of danger lingers as the players’ characters, your humble thieves, enter the city. At the very center of the board, in the palace, rests the emperor’s ruby. Is it guarded? You bet! But a cunning thief can still sneak past the unsuspecting security force. Things change dramatically once the ruby has been stolen and the alarm is raised. Only one of the four city gates remains open as a possible place to escape, and it is this quarter in which additional guards and captains are deployed. Plus, they are more alert now, acting quicker, seeing further and moving faster. And as if that were not bad enough already – the clock is ticking fast until the city goes into full lockdown mode, and every thief remaining within the city walls is caught for good. Panic time? Sure… then again, you didn’t become a thief without good training and a few tricks up your sleeve…! The cool part about Age of Thieves is how it integrates the traditional roleplay concept of initiative into its mechanics along with a clever structure of planning and execution phases. Basically, each player in their turn can play and execute the effects of any number of action cards. Some cards are always at your disposal (e.g. basic movement and refreshing your card hand) while for the rest you depend on the draw pile. 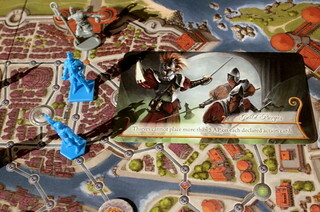 Players secretly plan their turn in advance behind a screen, using as many of their action cards as they wish to execute. On top, all players receive ten Action Point (AP) cubes per round. With these AP cubes, players can determine the priority and sequence of their actions – a card with ten APs will therefore be revealed and executed early – but since only cards with at least one AP get executed at all, players have to decide if they want to do something really urgently – with the side effect that the number of things they can do will be decidedly limited. If you don’t really care about when your stuff gets done, you can go with more cards and fewer APs on each. In either scenario, be warned: Other players’ actions may affect you either before and after you made your move, and it is wise to be alert for their trickery! To illustrate: Certain action cards will allow others in your vicinity to steal jewels from you, immobilize you, or put a guard to an empty guardhouse right next to you. On the other hand, cards can make you invisible to the guards, give you extra movements or throw smoke grenades which allow you to sneak past right under a guard’s nose. 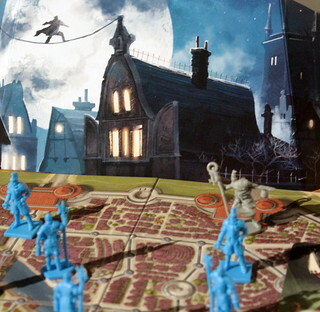 A slightly more predictable thing that happens is the movement of the guards – whose initiative (between 1 and 8) is determined by a dice roll before players start planning and who mostly follow a simple set of rules. Once the players have concluded planning, the screens are removed, showing the number of cards each player has melded (face down), along with the respective AP cubes on top of them indicating their initiative. Now, by descending imitative order (ties broken in sequence from this round’s start player), the cards are revealed and executed by the players, with the guards’ movement at the point reflecting their initiative roll. Once all cards are revealed, the used action cards are discarded and a new round starts. 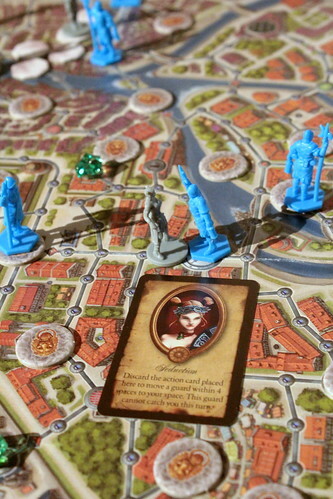 At the very beginning of each round, there is an event card which not only places a yellow jewel in one of the city quarters, but which slightly alters the normal game rules for this round. And as is appropriate, the event cards in the alarm phase have a much meaner streak than the ones in the calm phase. 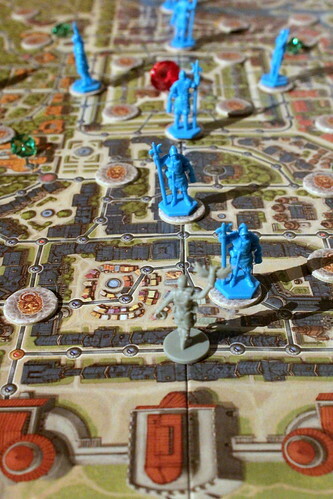 Aside from the added jewels, there are a number of city tokens on the board which players may flip over when they pass. Many of them have positive effects, but others will bite you hard, adding some push-your-luck element as well. Thieves cannot just hang around and collect minor jewels while ignoring the emperor’s jewel… at least not for long! If no one has taken possession of the crown jewel after ten rounds, all players automatically lose. On the other hand, it’s a perfectly good strategy to let someone else grab the coveted jewel and hope the guards catch him while you abscond with lesser loot, because Age of Thieves has different levels of success. Finally, as you would expect, thieves are not all the same. Therefore, all characters have special abilities as well as one special permanent action card at their disposal, significantly affecting that character’s preferred strategy and approach ranging from Grenades to Seduction. Guards (and additional senior Captains introduced in the Alarm phase) move in a predictable way, as they can see thieves at a certain distance, and usually move one space less than they can see. This allows thieves to get the security out of position, and then sneakily sneaking around them with sneakers, a snicker (and maybe a snack)! Thieves which are caught by the guards are thrown into a dungeon, and some of their loot is dispossessed. That thief is not out of the game, however, but returns to the game in the next round, even if lighter in terms of possessions and with fewer APs. Age of Thieves works really well for a number of reasons. Due to the limitation on possible rounds, it keeps the duration in bay without making that number feel arbitrary. Its biggest strength is maybe that the rules create a very good atmosphere and immersion, which starts quite relaxed, but grows more and more tense as the big heist approaches, only to break into a rush from one moment to the next. 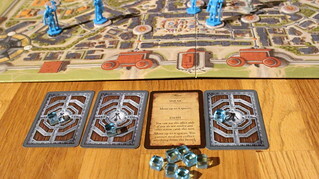 The first half of the game – until the theft prompts the alarm – can be very quick but is usually somewhat moderately paced, as players collect minor jewels and collect action cards which will help them escape, steal valuables or manipulate the other thieves and guards. This is important as once the alarm is raised, the game turns on a dime into a frantic chase to escape – so whether you are the one who steals the emperor’s jewel or another player keen to take it from the equally not-rightful owner, having a good set of action cards is very important. Just running in and grabbing the crown jewel usually won’t cut it. Another big draw is the initiative mechanism described above. Having to decide between few but early and usually uninterrupted actions on the one hand and later, potentially perturbed but more plentiful actions on the other hand is often a tough decision, and preparing to leave yourself multiple options is definitely desirable. On the other hand, since you are not locked into a fixed programming (like e.g. in RoboRally) by your cards, you can usually make at least minor adjustments based on what is happening around you. The rules are bound to be a little too plentiful to fully grasp all their nuances on the very first game – and knowing which action cards exist undoubtedly makes you a better player – but that doesn’t take anything away from the fun even on a first go. Components, symbols and icons are all clear enough to give you a quick understanding of what is going on (or might happen next! ), which is vital for a game with a lot of card effects. Overall, we liked the balance between strategy (both your own and other players’) and the aspects of the game making it unpredictable. The characters’ special features and abilities seem to be quite balanced initially, while it will be interesting to see how ‘locked’ into a perfect strategy you become based on your characters once you have played it a few dozen times. Being mean to other players is part of the game concept which may turn away some players, but for us it certainly wasn’t the defining characteristic of the game. So, in summary, Age of Thieves delivers a very captivating play experience and a lot to like. Or, in a nutshell: Quite a steal!